In a previous post on creating the Metro lights out game, I mentioned the solver. The solver is intended to demonstrate a solution to the current game state. Had I just wanted to demonstrate the solution to a specific puzzle, I could have inverted the puzzle creation matrix and then executed the moves backwards. The general form solver is tricky because when you are solving lights out puzzles, you need to have a strategy for actually solving; randomly clicking pieces on the board can create circular loops that return the game back to previous states. If you go too far down a path of a solution, you may end up worse off than when you started. For my solver, I produced an algorithm that attempts to intelligently brute force a solution from a solver state. To begin working on a solver, you need to create a means of simulating moves so that attempts can be recorded and played back. I took an object oriented approach and added a LevelSolver class. The LevelSolver class is constructed from a Level and then creates its own internal representation of the Level. 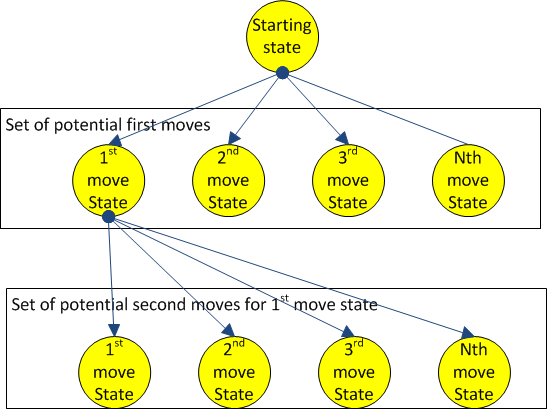 A second class, SolverState contains a list of the moves that were performed to get the level to its current state and the state of the current game (a temporary game board). The SolverState class can simulate moves and then it will have a new state. From this point, you could try and brute force the solution by randomly clicking moves. Solving in this manner will probably never finish as making moves and not tracking them would not suffice. The deeper into the graph that is traversed, the move moves that the solution has. That particular graph was represented as an n-child tree. Each of the children of a node is a potential move that can be made from that particular game state. At this point, we can traverse our imaginary graph to find a solution as the path that leads to the game state where there are no more blocks to eliminate. Now that we have a way of thinking about the problem, solving it becomes a little easier. The first thing that you probably want to do is avoid making the same move twice so that you eliminate circular logic in your graph. 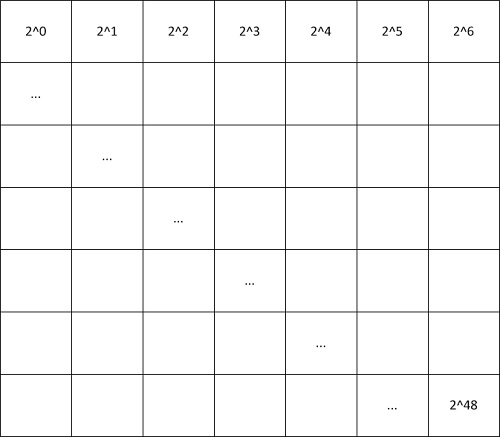 Since we have a grid of 49 tiles (7×7) and each has a state of on / off, you have potentially 2^49 states – many billion potential states… but still small enough to store in a 64-bit value. You can represent the state by summing up the squares to a value. The following image illustrates this. Now that we have a way of eliminating moves, we can traverse the graph completely and can find all of the solutions. This is great, except, the problem space is too big to do this quickly (2^49). So, we need to have the solver pick more intelligently. For example, the first optimization should be that the algorithm does not choose moves that don’t eliminate squares. This works very well for simple games and works alright when we start seeing more complicated ones. It’s not good enough for solving all of the games that I programmed into my app, but is a good starting point for a general form solution. // TODO: can we free theState? Incorporate some evolutionary programming by changing the maximum depth that is searched or evaluate other variables such as the distance to a board edge and try and iterate improved strategies over time. Program the brute-force solution as a multithreaded app and move it to GPGPU. Let me know what you think? Are there other cool strategies you can think of?